Wanting a deposit on a house? A new car? Or simply want to save for a rainy day but find you have nothing left at the end of the month to put away? Well keep on reading..Here are afew tips that help me when I need to save for something..
1. Try to not keep any cash on you -- Cash is so easy to spend! Using your card makes you think twice so try to keep a very minimal amount, if any cash on you. 2. Shop wisely -- Even if it's a food shop just buy the essentials. Don't buy the most expensive brands for everything go cheap! 3. Don't treat yourself so much! This may sound bad but you gotta do what you gotta do if you want more money and if you can go without that £30 dress then do it! 4. Set up a savings account -- Set up a direct debit each month to go into a savings account, if you can put more away that month then do it manually. You can also make it fixed so you can't withdraw the money for a certain length of time, but do what is right for you. 5. Now I live on my own, I am so careful about bills and I switch off all the plugs I am not using at that time. It has saved me nearly £40 a month just doing that! I do not use a tumble dryer, I let everything air dry which again saves a huge amount of money. 6. If you own a car, then every year look online for a new insurance as you can end up saving yourself a fortune! 7. Rather than going straight for the heating, get yourself a onesie! We all have one at home and it keeps you so toasty and cuts the cost of gas/electricity! Hope these tips have helped :) Let me know if you have any tips which help you save! If you knew me, you would know that I have such a love for all animals! It doesn't matter what type of animal they are (apart from sharks -- biggest fear ever). 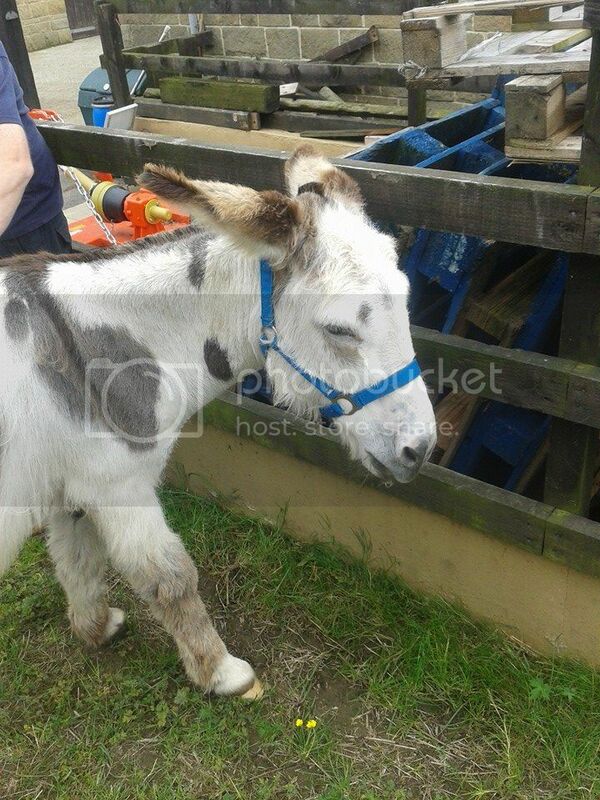 We randomly decided to go to the Donkey Sanctuary, Leeds as something to do more than anything. It was surprisingly quiet.. Infact, it was only me, my dad and my brother in the entire place. There was a plus side to this though and a man who worked there lead us round and told us a little bit of what this place is all about. He explained that not only do they rescue the donkeys (tbh that's what I thought the donkey sanctuary was) but they also allow children with disabilities to see them and have a ride on them which has fantastic benefits to their health. Also, what I found funny was they take a selected donkey to elderly peoples homes as a way of pet therapy. Can you imagine?! a donkey just turning up at your door ha ha. But the more I stayed with them the more relaxed I felt! They are very calm creatures to be around as they are quite slow and chilled. I found it sad that this place wasn't more popular as they completely rely on donations from the public. They have no other help whatsoever financially. They have childrens play areas right next to where all the donkeys are, they have grooming days, food, picnic area and have really tried to make it a special place. I was so impressed -- I ended up "Adopting a Donkey". Of course, this does not mean I am taking one home ha ha but it is a yearly donation towards the upkeep of the grounds and the welfare of the donkeys..so here he is. Firstly I should apologise massively for the finger prints on these perfume bottles I thought I could edit them out but never mind ha ha makes it all the more personal I suppose! These are my 4 all time favourite perfumes I have been using this last year and I love them all! Now I don't know about you, but personally I don't really wear strong perfumes throughout the day as I find them to be a bit over powering, but for a night out a powerful scent is essential! Through the day I am using a body mist by Gilly Hicks in the scent Blue Camden which my boyfriend got me last Christmas and it smells lush! 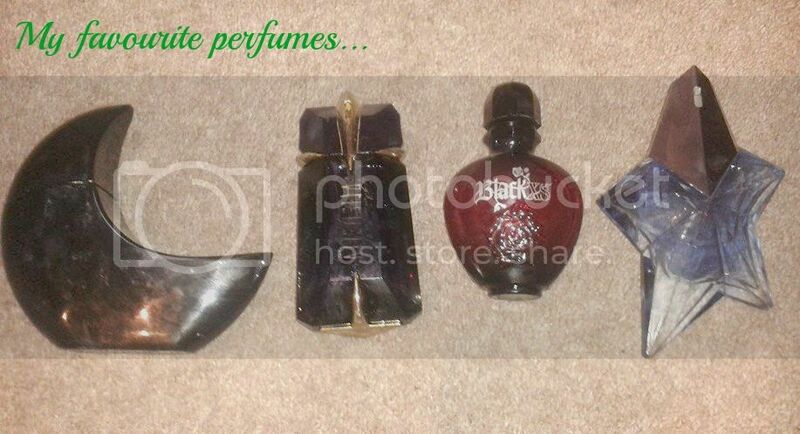 On the picture above, from left to right we have Ghost Deep night, Alien by Thierry Mugler, Black XS and Angel by Thierry Mugler. Alien -- This scent by Thierry Mugler is my all time favourite and I will definitely be buying this again when it runs out. It's the one perfume I can spot from a mile off if someone is wearing it because there is not a smell out there like it.. This perfume contains white amber, cashmeran wood, and amber. The staying power on this is incredible though it gets 10/10 from me.